Start with the desktop. We offer a variety of desktop colors and materials to match your style. Need help? Call or chat with us! We advise measuring your office to help you decide which is the perfect desktop size for you. The most popular widths are 60" and 72". Sale and clearance desktops are limited in selection and quantity on hand, so get them before they run out! The selection of desktops offered here is always changing so don't wait when you find the desk that will fit perfectly in your space. The Desktop Style Menu will list the most current product selection. If you have any questions about our sale and clearance desktops, don't hesitate to call us at 800-531-3746. The UPLIFT Height Adjustable Standing Desk frame comes in four color choices: black, gray, white, and metallic (industrial style), and is offered with a cast-molded aluminum foot for extra stability. The Back Acoustic Privacy Panel by UPLIFT Desk is available in four different sizes to fit UPLIFT desks that are 42" to 80" wide. Add the Side Modesty Panel with Wire Management to one or both sides of your UPLIFT Desk. The left and right-sided panels are interchangeable, so you can easily reconfigure your desk in the future. The integrated mesh pocket provides an additional avenue for cable management. Good news—we're updating this page to showcase features of our new UPLIFT V2 Frame, but it's not quite ready. Thanks for your patience! Get your dream ergonomic workstation even cheaper with a discounted desk! We have a large selection of clearance laminate and bamboo desktops that are ready to ship. All desktops are new and top-quality, but are sizes or styles that we are no longer carrying. Pick the style and shape that elevates your office in the direction of better ergonomics, and pair with our popular UPLIFT height adjustable desk frame for the complete desk that keeps you working. Buy five of the same style and size desks and save even more! Orders of five or more save an additional $100 on each desk. All the desks must be the same. Order now for savings! Are there any additional discounts I can get on this desk? You bet! Save $100 per desk when you buy five or more clearance desks. What kinds of desks are on sale? 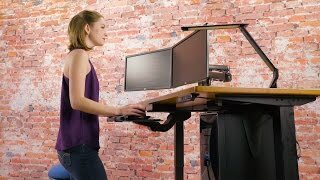 Sale and Clearance Height Adjustable Desks from UPLIFT Desk are unique, one of a kind desks that were created but not sold, which means savings for you! With a rotating selection of desks to choose from, we suggest checking in often to see what we have in stock. What about solid wood desks? We boast a surprisingly eclectic and varied collection of Eco, Laminate, and bamboo desktops, which lets people of all tastes and spaces create the desk they want and need. At this time, we do not have Sale Solid Wood Desks. Why are these desks on sale? UPLIFT Desk is the leading standing desk maker on the market, so they end up with a few desks here and there that are functional, beautiful, and in need of a good home or office. These are offered to the public at a discount, which means savings for you! What is the thickness of these desktops? UPLIFT Desk desktop thicknesses are as follows: Eco (.75"), Laminate (1"). If you have any questions, just give us a call and we'd love to help you find the desk you're searching for. What is the lifting capacity on this? UPLIFT Desk lifting capacities vary desk to desk. But you can rest easy knowing that UPLIFT Desk frames are some of the stablest and most reliable around, with a lifting capacities of 355 - 710 pounds. I want a specific desk. Can I pick one I don't see here? If you're on the hunt for specific type of desk that you don't see here, let us help you find it elsewhere on our growing UPLIFT Desk Height Adjustable Desk page. Can I get grommet holes on this desk? UPLIFT Desk Sale and Clearance desks are considered "one-offs", so some desks have grommet holes and others do not. Check the details of our available desks on our convenient desk builder to see which one meets your needs. Look at the silver label on you control box - if that sticker says v4.1, v4.2, or v4.3, you have the newest version of UPLIFT Desk's control box, which comes with a few exciting, new features! You'll love UPLIFT Desk's new control box because it comes with two new safety features: Keypad Lockout and Collision Sensitivity. The Collision Sensitivity feature allows users to set the sensitivity for their desks to one of three levels, so when adjusting for height, the desk stops when it touches an object instead of continuing to go up or down. Keypad Lockout allows users to keep unwanted hands from adjusting your sit-stand desk when the feature is activated. And users will now be able to switch quickly between One-Touch and Constant-Touch modes, in addition to being able to toggle between inches and centimeters. Does this come with a three-stage frame? Yes! All UPLIFT Desk frames are three-stage so their desks are 33% faster thanks to using 3 spindles in each leg instead of 2. This means you have a higher adjustability range so desks fit more users, shorter users, kids, all the way up to very tall users or people who plan on adding a treadmill to their desks later. If I live outside of the US, will this desk work for me? Will it work with my outlets and voltage? Every desk UPLIFT Desk makes is designed to run on the US electricity standard of 120 volts. So if you do order a desk from outside the United States (excluding Canada), you'll probably need to plug your desk into a step down transformer before plugging it into your power source. Not doing so makes you run the risk of overloading your desk's control box, which is not covered by warranty. Please contact our team via call, email, or chat if you have any questions. $449.00 List Price: $899.00* The list price is the same as the MSRP (Manufacturer's Suggested Retail Price). It may not necessarily be the price at which the product is sold.